The Dehradun Police arrested two persons who were at the ready to provide logistics support to the escaped fugitives. CHANDIGARH: All it took was a phone call to track down ‘dreaded’ militant Harminder Singh alias Mintoo? The 49-year old Khalistan Liberation Force chief was one among six people who escaped from the Nabha high security jail on Sunday in an unprecedented prison break. Mintoo, who according to police, made a call that did him in. Punjab police, which traced the call and drew information of whereabouts from cell-phone tower data, tipped off Delhi police, who nabbed him. The Dehradun Police also arrested two persons who were at the ready to provide logistics support to the escaped fugitives. Talking to Express, Senior Superintendent of Police, Dehradun, Sadanand S R Date said, “We have arrested two persons— a lady and a man. The lady’s name is Geeta, wife of (a former Nabha jail inmate) Sunil Kumar, and other person is Binny. They were to provide logistics support to the fugitives, if they came to Dehradun. These persons were in touch with Parminder Singh alias Penda, who was arrested by the UP Police yesterday. “During the search of the house, police recovered mobile phones, SIM card, rods, fake Aadhaar cards and driving licences. Sunil, Geeta’s husband, was lodged in Nabha jail from 2009 to 2012, from which time the fugitives knew him and got in touch with him,” the SSP said. Sources in Punjab police said they have been intimated by the Uttarakhand Police that two of the accomplices of Parminder Singh have been arrested. During interrogation, Parminder revealed that besides him seven persons were involved in the jailbreak and that he was in contact with them through WhatsApp. Of these, five fugitives were in Karnal and Panipat in Haryana, he said. The police recovered two SLRs (self-loading rifles), three rifles, 544 cartridges and a mobile phone from his possession, claimed sources. Police sources also claimed that Mintoo was travelling in the Toyota Fortuner with Parminder Singh of Jalandhar, who was the mastermind behind the escape, and an associate of gangster Gurpreet Singh Sekhon lodged in Nabha jail. Parminder was on Sunday nabbed by Uttar Pradesh Police from Kairana in Shamli as he was on his way to Nepal. But Mintoo got off from the SUV at Panipat in Haryana and proceeded towards Delhi. After reaching the national capital, he called a relative in Subhash Nagar in Delhi. To his surprise the mobile he was using was being tracked by the intelligence wing of the Punjab Police which immediately alerted the special cell of Delhi about Mintoo’s location and he was nabbed. There are no details about how police knew of the mobile phone in his possession. Sources claim Mintoo was on his way to Nepal and that he planned to head to Malaysia on the way to his final destination, Pakistan. But the person based in Uttarakhand who was handling his escape from jail backed out. Mintoo was told board a train to reach Uttarakhand from where he would be taken to Nepal, as he was in regular in touch with his contact there. Mintoo was arrested from New Delhi railway station this morning. A team of Patiala Police has reached Delhi to take custody of Mintoo. Police sources claim that during initial interrogation, Mintoo said two jail officials and an inmate facilitated his escape. He said he came to know of the escape plan as from a gangster named Vicky Gondar, whom he was introduced to by the inmate and jail officials. 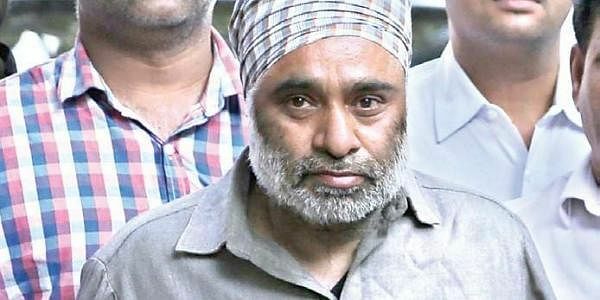 Punjab DGP Suresh Arora said Harminder Singh Mintoo was in touch with terrorist groups in Pakistan but the jailbreak conspiracy was hatched by the gangsters. He said an excellent national coordination among security forces led to the swift arrests. Meanwhile another car used in the jail escape was today found abandoned at Pharal village in Kaithal district of Haryana. “A car was found in the village, we are investigating,” Superintendent of Police, Kaithal Sumer Partap Singh, said. Yesterday another car, a Hyundai Verna, had been found abandoned at Solumajra village in Kaithal, with two number plates. A search of the car today revealed police uniforms in a bag and a few mobile numbers written on a piece of paper.